You can’t see a brand without a social media presence today! It has become a great resource to increase the social engagement with your brand, thus sales. So, all you need to expand and improve your business is ‘Social Media Management and Marketing’. Just posting some content on different social media platforms with a few shares can be done by any company but 7 Stones Digital makes things different! People often confuse for social media Management with marketing, even some agencies do, but the purpose for each one is different. Social Media Management is all about the daily tasks to keep your social media platforms active and interesting for the user engagement, whereas, Social Media Marketing involves utilizing the social media platforms effectively for conversion, most of the times, it could be the paid marketing. 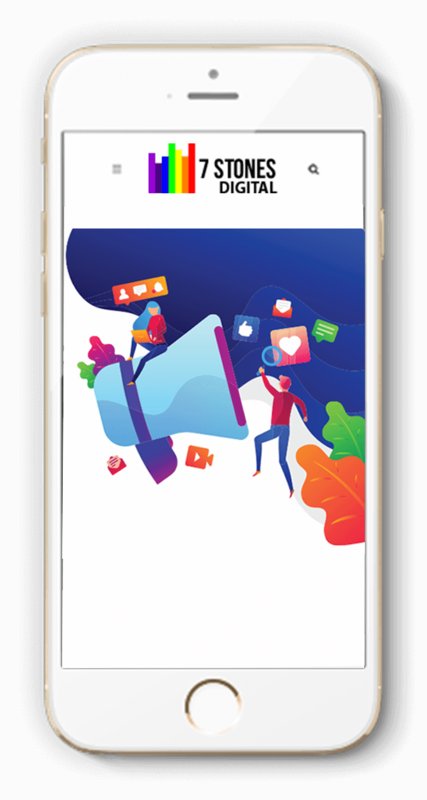 7 Stones Digital, one of the best social media agencies in India and the USA, provides both the Social Media Management and Marketing Services that pushes forward your brand in the market and increase conversions. There is a lot involved in managing daily tasks to meet the demands of business in terms of social media. We have a good number of social media marketers who can take care of multiple projects at a time. We understand that it is hard for any company to manage the whole social media alone and that’s the reason why we exist! We have a team of perfect online marketing experts to take care of it. Being professionals in managing numerous social media projects, the team of 7 Stones Digital will come up with perfect social media strategies that work for a specific brand, as we understand the same strategy doesn’t work for different projects. There are countless social media platforms over the internet and the count is increasing frequently but there are 6 top social media platforms that every company should focus on, to make your brand reach more targeted people, increase the traffic, conversions, and sales. There is a lot of value to Google+ in terms of SEO, so there is no point in neglecting it. It is one of the largest social media websites with over 500 million accounts. So, it is a fact that every online business needs presence on Google+ too, just as Facebook, Twitter, and big social media platforms, to boost your business. 7 Stones Digital helps increasing sales with Google+ techniques after analyzing your business. Instagram is an online photo and video sharing platform which has 500 million daily active users. You can use Instagram for promoting your business in the form of visuals. We, at 7 Stones digital create quality, unique, and attractive images and videos that fetches you a great number of likes and followers on Instagram which in turn increases the presence of your business thus conversions and sales. There would be no single person who doesn’t know Facebook and for many people, their day starts with it. It has 1.40 billion active users in a day! This is the main reason why one shouldn’t miss Facebook marketing for their business. Creation of Facebook page for your business and marketing it using right strategies is the key to improved business. Though it takes some time to build followers for your page, it could be appreciated once you start getting leads from it. Posting consistently and advertising on Facebook are the two best ways to improve the visibility of your business. There are many companies out there who can improve your presence through Facebook marketing, but to what extent and at what budget is the actual question! It is a fact that one has to spend a lot of money on Facebook ads, if required. At 7 Stones Digital, we will show you the significant improvement in visibility, Sales, and business. Also, every dollar will be spent wisely on the ads after understanding your target audience. Facebook campaigns need to have a perfect strategy, right target, and creative content to be successful and we will help you with it. Our experts analyze and understand your audience before coming up with strategies and campaigns. All it needs to be successful in Facebook marketing is patience and spending enough money on ads at the right time. Establishing an online presence for your business shouldn’t limit to Facebook as there are many other social media networks that increase brand awareness and improves your business. Twitter is one among them and it has 328 million monthly users. A tweet with a simple image and a hashtag can do a lot to your business. Twitter for your business is a good idea as many people use it to discover new things and buy services or products from the people they follow. 7 Stones Digital creates a twitter account with a custom theme and also manages twitter ads for your business. Pinterest has become more popular over a decade as it is receiving millions of new users every day. It is an image based site which asks you to pin original visual content to the board. If people find them attractive, they will share or re-pin your images. A lot of E-Commerce websites use Pinterest to get direct sales through the referrals. At 7 Stones Digital, our designers will create rich pins for your brand and market them to increase the sales. Click the button tO GET A SOCIAL MEDIA MARKETING today!